1. Boil water in a pan. Wash ada and cook it in boiling water for around 20 mts or until it becomes soft. Strain and rinse with cold water to prevent further cooking. Meanwhile melt the jaggery in around 2 cups of water and strain it. 2. Heat ghee in an uruli or a deep pan. Fry the raisins, cashews and coconut slices one by one and drain on to a paper towel. Now add the ada and saute in ghee for 3-4 mts adding more ghee if required at medium heat. Add the melted jaggery, cook at medium heat stirring in between. When it thickens, add the thin coconut milk. Bring down the heat to medium-low and cook until it thickens, stirring in between. Now add the thick coconut milk. Mix well and add the dry ginger powder, cardamom and cumin powder. Mix well, cook for 1-2 mts at low heat and switch off. Garnish with the fried cashews, coconut slices and raisins. Close with a lid for at least 15 mts to lock the flavors. Serve hot or cold. wow…drooling payasam dear…want to have it right now.. Very tempting pics !!! I love payasam with jaggery and yours looks so perfect !! This is so delicious,adding jaggery is so interesting…yum! Looks so tempting! So are the photos! LOoks yum….delicious and healthy…lovd the fab click…! Very new to me..looks total yum!! Beautiful looking ada pradhaman, very tempting..
Kidilam payasam.. for me sadya is never complete w/o a sarkara payasam…. WOw wow wow..looks authentic and my fav one too..u gals did great job by posting the sadya dishes sure i will keep this a reference and bookmarked many… wonderful . 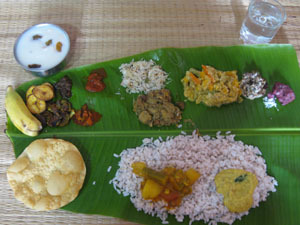 Omg, am hungry now..Such a delicious ada pradhaman! !my all time fav..
Whoa that looks authentic and delicious. Slurpp. did you use home made coconut milk. I tried my hand with store bought and was not really happy with the results 🙁 How many coconut do you think I will need for this recipe. I am seriously craving for some good Ada Pradhaman. Thanks in advance. I am new to your blog .What does ada mean ? We;come to our space :). Ada is basically rice flakes that is made of rice flour. You can easily find it in Indian stores. We will post its picture soon. Lakshmi used 3 coconuts for that ada pradhaman recipe. Grate those coconuts, add around 1/2 cup warm water and squeeze to extract thick coconut milk(first extraction). Now add more water (around 2 cup or so) to the already squeezed coconut and squeeze again to get the second extraction or thin coconut milk. Finally strain the extractions through a fine sieve. hi i just wanted to say thank you for posting this recipe..i have made it 4 times now and it’s always a hit, everyone loves it…i like that it doesnt require too much ghee and has a lot of flavor..thanks! Thank you so much for the wonderful recipes…always super. very well presented and looks yummy and delicious.what about trying the dairy-milk? Hi, Can we use canned coconut milk when we need to do this recipe quickly? Thank you Maya for the reply. Will 3 cans of coconut milk be sufficient for the preparation of 200 -250 gm of Rice ada / rice flakes.